This month we choose to read “Beauty and The Beast”. This is a story from the “Collins Treasury of Fairy Tales” from the Nenagh Library. 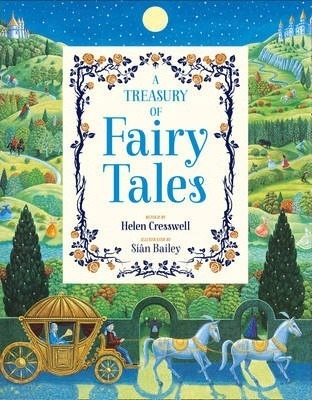 This is a very old fairy story and this version is retold by Helen Creswell and illustrated by Sian Bailey. This story is about a kind beautiful woman called Beauty. Both of her sisters are jealous of her because she is such a nice person. After Beauty’s father loses all his wealth he travels a very long distance to try to recover it but on the way he gets lost in a storm. Thankfully he finds shelter in what he thinks is an empty castle. The Father stays there in luxury for the night. The next morning as the Father is leaving he sees some beautiful red roses and he picks one for his beloved daughter Beauty. All of a sudden a monstrous Beast appears and demands that the father bring his daughter back to live in the castle. Beauty has to live with the beast and she is very frightened by his appearance. However the beast treats Beauty very kindly and takes great care of her. Over time Beauty falls in love with the Beast. When she tells him that she loves him he turns into a handsome Prince. He explains to Beauty that a curse was put upon him and could only be broken by someone who could love him in spite of his appearance. Beauty and the Prince were married and lived happily ever after. Kim: I think the story is really enjoyable. Beauty is such a lovely person. Susan: I think it is a fabulous book. Beauty is very kind to her father. Martin: I loved reading this book. I got a big surprise when the beast turned out to be a man. Kevin: I think the ending was a great surprise. I loved the book so much I bought the DVD. We would like to add that we watched the DVD and it was great seeing all the characters in the book come to life. In conclusion we all agreed that we would recommend this book to our friends and family. We hope you enjoy reading this book as much as we did. Watch this space for our next review!! !